Before we get on with the new class (which may or may not work, but it’s a fun experiment), I want to announce that all my hard copy books are 10% off right now at Lulu.com. Go check ’em out if you’ve been waiting, and keep your eyes open for Lulu.com sales to make the deals even sweeter. In my quest to create yet another odd character class, I have dreamed up the canting crew. Actually, the inspiration for the class was a small band of robbers cutting a swathe through time after stealing a map of creation. You’ve probably heard of them. 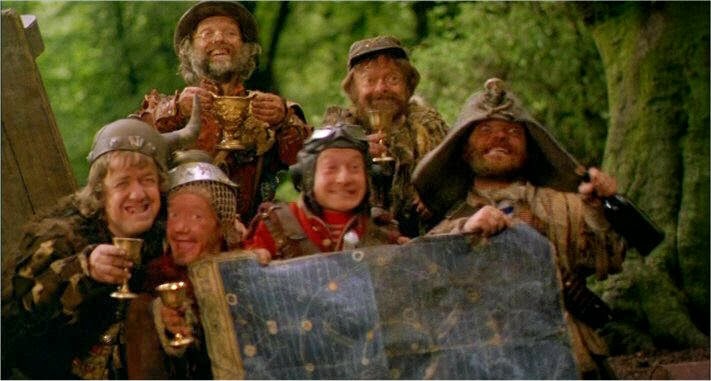 Watching Time Bandits made me think of a band of halflings causing trouble, and that made me think of the swarm rules in d20 and one thing led to another and … the canting crew. Obviously, this is not a traditional character class, so it’s not only not for every player, but not for every campaign. Truth be told – I have no idea if this will even work. A canting crew starts out as a single rogue, the boss. As the crew gains levels, it also gains members, with each member representing one hit dice, or level, of the crew. 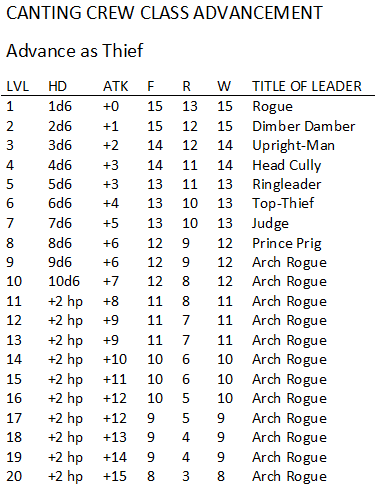 Each time a new member is added to the crew, that member should be named, and a dice should be rolled on the following table to get an idea of what that new member brings to the crew. When a member of the crew brings a competence in a task, that particular member is skilled in that task, and his presence and tutelage makes Gives rest of the members a knack in that task. If a canting crew is divided, this distinction might be important. The canting crew attacks as a swarm. Attacks against the crew deal damage to the band’s collective hit points. The crew can split up to make attacks, or even choose not to throw all their weight against a single opponent. For however many members of the crew are attacking a single foe (usually no more than eight against a medium-sized creature), treat the attacks as coming from a robber crew of that level. Thus, three robbers attacking a creature attack as a 3rd level crew, i.e. with a +2 attack bonus. The crew, no matter how they are split up, uses saving throw values for their crew’s full level. Any feat taken by the robber crew is assumed to be held by all members of the crew. Feats or abilities that come with individual members are possessed only by that member. 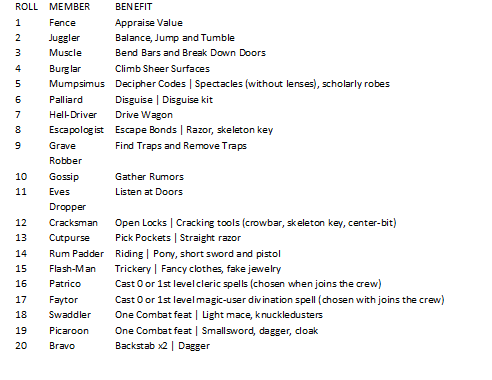 On the downside, robber crews are composed of multiple halflings or gnomes, and each member requires his or her own equipment and rations. This makes running a robber crew a bit expensive, so make sure you don’t pass up a chance for treasure or theft! Damage against a robber crew must also be addressed. When a robber crew’s hit points are reduced to 0, it is assumed that all of the members have been killed, the boss being the last to fall. For every three points of damage a crew suffers, there is a 10% chance that one member, chosen at random, is killed and must be replaced when the crew next reaches civilization. While the crew is short a member, they are also short that member’s skills or abilities and their help in a fight. When the crew does reach civilization, a new random member is added to the crew. A 3rd level canting crew learns how to cover one another’s retreats. Members of the crew can retreat at a full run without drawing an attack from their foes. A 5th level canting crew’s chattering and dodging about has a chance of confusing their opponents. Each round a crew decides to caper instead of actually attacking, their foe must pass a Will saving throw or be stunned for that round. To confuse an opponent, at least three members of the crew must be engaged in combat with that opponent. A 7th level canting crew learns how to look out for each other. They roll their chance of being surprised on 1d8 instead of 1d6. In addition, when they fight, each member of the canting crew engaged with a single creature over the first member increases the Armor Class of the group fighting that creature by one. A 9th level canting crew can establish a hideout for themselves, per the thief class. The canting crew does not attract a lieutenant, but they do attract a number of lesser rogues and thieves, with the members of the canting crew each taking on a small gang of their own to tutor and control. OMG, FANTASTIC! Also, three words: JAWA RAIDING PARTY! Jawa Raiding Party – love it! That would be a great modification for a sci-fi game. Little green or grey men probing things in uncomfortable ways would also be fun. Garrison – if any mischief is ever wreaked by this class anywhere, I will be immensely satisfied. It is not open content yet … will be when I publish it in NOD. In the meantime, though, consider this my permission to you to do whatever you want with it. Awesome, John. For this, is awesome.